Now the morning and evening devotional prayers of Martin Luther can be sung by all! This prayer can be used during morning worship or during private devotions. Consider using it with children as a catechism tool to help anchor the texts firmly in kids’ minds. The voicing is flexible for unison or two-part with optional congregational involvement. 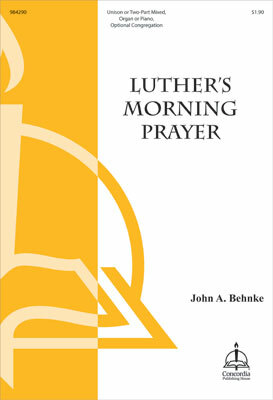 A companion version of Luther’s Evening Prayer is also available.